I recently spent a full week back in Btown, and I had a blast. I was there for my grad school residence week, and it was awesome to introduce my classmates to some of the best of my hometown. 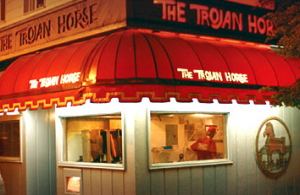 Trojan Horse - Americanized Greek! You can get kebobs and gyros, but you must order the flaming "Saganaki" cheese. It's a greasy spoon, but a local favorite. I know my sister really enjoys this one when she's home. The Village Deli - This might be my favorite on Kirkwood. I love that I can get breakfast all day long! I had a breakfast burrito big as my head; I could only eat half of it. The chili smelled amazing, and my classmates devoured the food. We shared some seasoned fries that were great too. Yum. Laughing Planet Cafe - You guys, I'll admit I never ate at Laughing Planet before this trip home. I know! I kept going to Chipotle for burritos. When my friends wanted some less greasy food, I suggested this place, knowing that it's a pretty good locavore spot. I was so happy we did. I had a grilled chicken burrito, and everyone loved their meal. It may have been one of the favorites on this list. So fresh! It also has eclectic and fun decor, very much a Bloomington place. I'll be back for sure. And to think... I've been shopping at next-door Cactus Flower forever. Hartzell's Ice Cream - I really wanted a little sweet treat, so a kid's cup at Hartzell's was spot on! When I was growing up, if I wanted ice cream I went to Jiffy Treet or White Mountain. (There was once a Ben & Jerry's, but the local cream drove it out of business!) Now that my old standbys are gone (Chocolate Moose is still around, but not on Kirkwood!) Hartzell's is the place to go. I love that they have some carbolite and frozen yogurt options too, as well as unique flavors. There are so many other places to eat in Bloomington... on the square, off the square, on 4th street. But since we stuck to Kirkwood, I think we experienced a good mix. I know that I enjoyed rediscovering my hometown a bit, given that I don't always eat out at restaurants when I'm home! Have you ever been to Bloomington? What's your favorite spot on Kirkwood? Oh neat!! Is this Bloomington IL, or IN? Come to think of it, I think there's a Bloomington in MN too. haha. Anyways, I love finding unique places to eat! That ice cream shop looks really good, glad you were able to rediscover your hometown a bit! Bloomington, Indiana, home of Indiana University! :) I think there's probably a Bloomington in every state, but this one is my favorite of course.